Lets travel back to October 2007, to the peak of the previous bull run, just before the Great Financial Crisis (GFC) occurred where certain financial institutions started dumping their toxic asset backed liabilities (of course, packaged nicely and sold as asset backed securities). Over the next 18 months to March 2009, both the S&P and Dow Jones Industrial indices decreased by 45%. This meant the retirement funds of many moms-and-pops investors were essentially halved – a troubling event if investors meant to retire that year. Worldwide, indices were not spared and showed similar results. Some questions that arised from this observation were – first, why did the indices crashed by almost half? Second, were there companies that did better than the broad indices and perhaps even grew while everything else crashed? Third, if there are such companies, what can we learn and apply from them that might help us invest better now? Answering the first question is somewhat straightforward, and can be explained in terms of 2 broad concepts being 1) Valuations and 2) Monetary Tightening Policies. Broadly, in the years prior to October 2007, monetary policies were somewhat loose and caused valuations of assets worldwide to rise to very high grounds. In the 18 months prior to October 2007, the Federal Reserve of the United States started tightening the monetary policies as they began to worry about the overheating economy. But because businesses were doing well and reporting better results despite the tightening process, their valuations went even higher. By October 2007, the Price-to-Earnings Ratios (P/E Valuation) of some S&P 500 components like Google, Apple and Amazon were 50, 45 and 127 times respectively. These meant that investors were placing a lot of growth expectations (say, 100% growth in one year?) into these companies, directly or indirectly (through stock selection or investing with Funds or ETFs). That bubble eventually went out with a bang when the companies that collectively make up the index fail to match such high expectations amidst the monetary tightening process, naturally so since some businesses, high networth individuals and common folks had to pay more interest on their debts and thus tightened their wallets and spent less which in turn hurt business revenues further. Such was the vicious cycle. One of the many companies that answered the second question and managed to grow while most in the capital markets were gushing downwards, like salmons swimming upstream against the rapids in Katmai National Park, might be Fast Retailing, otherwise more affectionately known as our Uniqlo. Over the same 18 months while the S&P 500, Dow Jones Industrial and Nikkei 225 indices were down roughly 45%, Fast Retailing grew more than 60%. Not only did it swam upstream, it metaphorically leapt out of water and over large rocks and reached its destination. Which leads to our third question – how is this possible and what can we learn and apply from this experience to help us invest better? This answer come from two perspectives. First, quantitatively, Fast Retailing was valued at reasonable valuations even during the height of the GFC. Although its P/E ratio appears to be 19 times then, as shown in the following table, it was sitting on loads of cash which resulted in its Enterprise Value being much lower than its Market Capitalisation. The result was that the EV/EBIT ratio was low at 9 times compared to the indices and the high growth stocks. So, perhaps Fast Retailing was saved by its reasonable valuations which “should not go lower” since it was backed by a real business? 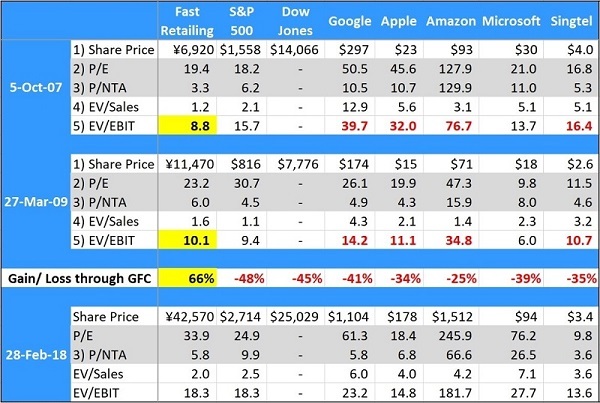 But Fast Retailing was not the only one with reasonable valuations – Microsoft was also valued at a reasonable 21 times P/E with a EV/EBIT ratio of 14 times, which did not seem to save them from the avalanche. So, what else might be the differentiating factors? As it turns out, unbeknownst to the moms-and-pops investors, Uniqlo was growing qualitatively, and went about their business quietly while chaos ensued. While their balance sheet was loaded with net cash of USD800m, Tadashi Yanai, founder of Fast Retailing, had his eyes set on sustainable global expansion rather than the typical Asian entrepreneur’s “Invest in property to make big money” approach. This was by no means an easy task given Uniqlo had just closed down a significant portion of their UK, China and US operations several years ago. Ever the entrepreneur, Yanai-san reflected on their earlier losses and struck to their roots of supply chain innovation and providing functional fashion at reasonable prices. Where local peers took weeks and months to renew their apparel lineup, Uniqlo was able to go from apparel design phase to global store rollout in 14 days. While peers focused ever more on designs and price differentiation, Yanai-san sought to standardise (fast) designs and cost reduction. Instead of being just another apparel retailer, Tadashi Yanai sought to be the fastest logistics retailer, thus the name Fast Retailing. The combination helped the company consolidate market share wherever it went. While the world was reeling in the full effects of a slowed economy, consumers, seeking to reduce their expenses, found Uniqlo’s offering functional, fashionable, and reasonable. Uniqlo stores were popping up faster than ever while peers closed their stores. Although Fast Retailing first expanded to Shanghai in 2002, it was only in 2007 when Yanai-san made a concrete resolve to grow overseas. It was then that their results started showing, after more than 5 years of “boiling the broth”. From 2007 to 2009, Fast Retailing’s Japan sales grew 29%, from 471b to 606b while their global sales grew 49%, from 54b to 80b, inching slowly from 11% to 12% of total sales. The investment community noticed, and appraised their valuation differently once it became clear they were serious about growing overseas. Fast Retailing have not looked back since. From 2007 to 2017, their Japan sales grew 123% in 10 Years, from 471b to 1,054b (That’s a trillion yen or USD9 billion worth of apparels). Meanwhile, global sales grew at an astounding 1,400% in 10 Years, from 11% of total sales to 43%, from 54b to 808b (USD 7.3 billion). Sure, anyone can say such inspirational words, for talk is cheap. The key then is for the ever-keen investor to trace what management said and contrast with what management did. In Fast Retailing’s case, Yanai-san is truly congruent between what he did and what he said, and together as a company they went on to positively impact more lives through their unique offering of functional fashion at reasonable prices. Clearly, merely investing in Fast Retailing now may not guarantee equal success in the following years, since their valuations now is much higher at 34 times P/E and 19 times EV/EBIT compared to the company’s valuations in 2007. If we go back to the “formula” of how Fast Retailing outperformed the indices and FAANG group during the GFC, the only factor out of place now seems to be the Valuation factor.